Realistically, most dog owners feed commercial dry dog food. So let's face it, that's very likely you. Well, OK. So be it! It's not a crime and I know you're trying to do the best for your dog. I'm fine with that. What I'd like to do on this page is take some of the guess work out. Figuring out dog food ingredients and finding the best dry dog food is like trying to find a needle in the haystack. colors and dyes to make the food look appealing to us the consumer. We're the ones with the money in our pockets, not the dog. Right? less than optimal sources of protein, unhealthy fats, and more. I am a raw feeder, but I do keep dog kibble in the house for occasional use. There is the convenience of having a good dry dog food handy in case I forget to thaw my raw, or heaven forbid, run out! It gets me out of a jam! One of the big problems with commercial dry kibble is it's lack of moisture content. Most dry dog food contains only about 7-8% moisture, compared to a raw food diet which is about 70% moisture, the same as our own bodies. 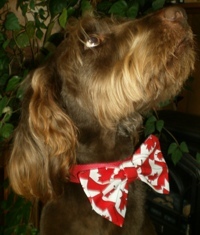 Over time, this very often contributes to kidney disease in dogs. See Health Tip in the right hand column. Some commercial dry dog food really is pretty good. Not as good as raw, but as good as it gets. If you have time, and are interested enough to do the work yourself, this dog food comparisons guide can help you . If you simply want to cut to the chase and get right down to the basics of choosing, let me help you. There are two important things I want you to keep in mind here. Is Dry Dog Food Dead or Alive? Well, it's dead, of course. There is not one single thing that's alive about it. Did you ever think about dog food that way? So you're feeding your dog, dead food everyday, day after day. Can this be good? Why is it dead? Quite simply, it's dead because it's been over cooked, over heated and over processed. Those cute little dog kibbles are found nowhere in nature, except in bags. So you see it doesn't matter if the dog food ingredients are, human grade, organic, all natural or whatever...it's all dead, killed from the heat of processing. When food is heated, the natural chemical composition of it changes, and those changes are not always good. If you do some research, you can find the list of toxins, and toxins created from heating food at high temperatures. No wonder that cancer is on the rise in people and animals. In fact cancer is the # 1 killer of dogs today, not to mention any number of other degenerative dog health problems and diseases. Human beings are the only creatures on the face of the earth that cook food. What? Where the heck did we get the idea that cooked food is good for our dogs? To be fair, it's OK if it's not cooked at temperatures higher than 118 degrees Fahrenheit. That's enough heat to kill most harmful bacterias and other pathogens. So in the case of our pet dogs, it is important to realize that no cooked food is perfect, and fit to be fed exclusively, everyday, for years on end. Think of your own cooked diet. You eat different foods every day, including some raw food, don't you? Well your dog needs variety too, so switch it up every week or so. This is also the solution to the problem of increasing allergies in dogs, which is based in the feeding of one protein source in processed food, day after day, week after week, year after year. No wonder food sensitivities occur. Seems Like a Good Idea Doesn't it? I'd like to focus on something that's important to know. In order to make a dry dog food, something is needed to make those little kibbles hold together. Well, that little ' something ' is almost always a ' grain ' or a ' starch ' or both. Truthfully though, you don't want either one. These dog food ingredients are used to decrease costs and bind the food into little kibbles. Dogs are carnivores and I know you wouldn't have gotten this far without realizing by now, that dogs need a meat based diet, high in protein and fats and low in starches and carbohydrates ( fruits & vegetables ), to thrive. So what are grains, potatoes and legumes doing in the food then? Well they provide a few important nutrients, but are a source of starch mostly. 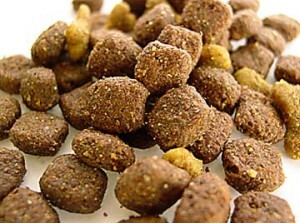 Starch is broken down by the body into a 'polysugar', a completely unnatural food for our carnivorous dogs. However, if you take the grains out, two things happen. Your production costs go up and you can't hold the kibble together. So you must replace the grains with something. To replace the grains, another form of starch is used, usually potatoes, peas, legumes or tapioca. So now we've gone from bad to worse! There's really no point in talking about the good dog food ingredients, such as protein from meat and other healthy protein sources, along with macro and micro nutrients from small amounts of fruits and veggies, and adequate supplementation. Until you get rid of the starches from grains or vegetables, none of it really matters. So are you starting to get the idea that the term ' Grain free ' is starting to sound like another fad, along with other suspicious statements such as, 100% complete, balanced, human grade, high fibre, no preservatives and hypo-allergenic. It's Possible to Use Better Dog Food Ingredients Of Course! Considering that the little kibbles need something to hold them together, but at the same time, that ' something ' needs to be nutritious and healthful, the use of meat concentrates and protein isolates from meat and select vegetable sources does an excellent job. This type of excellent dog food minus the ' grains and starches ' is available to you. 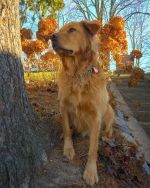 It's not perfect, since only Mother Nature provides the perfect food for dogs, but if using a better quality dog kibble makes sense to you, and it should, then read on to find my recommendation for the best dry dog food. This is the one I keep at home for occasional use. "I wouldn't eat that stuff if my life depended on it. Well...maybe I would!" If you feed dry dog food add 1/2 cup water to the kibble. Soak for 10 minutes before serving. This will replace some of the moisture lost during during the manufacturing process. Association for Truth in Pet Food.